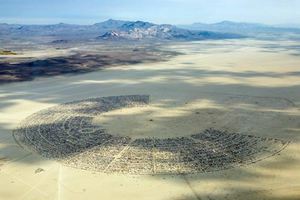 You could easily spend hours, if not days, digging through the Burning Man historical archives. Of course, these are mere artifacts — written and photographic echos — of the deep and rich cultural history of a community that can only be truly understood through the collective experience of its participants. But barring that, this collection serves as a solid starting point … and there are some amazing things to be explored. There are the annual event archives from 1986 to the present day; the Afterburn Reports, which chronicle the events and activities that went into creating Burning Man each year; the MOOP Map, which show the results of our Leave No Trace efforts through the years; Census Reports which show the demographics of our community; Black Rock City Maps, mapping the evolution of our city’s layout; and our archive of theme camps, the cultural fabric of Black Rock City. The other key part of Black Rock City’s story is our Art History.